Quick Results. No Downtime. Smoothing. Tightening. Firming. Filling. Face, Neck, Chest, Hands. 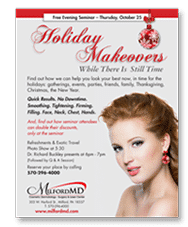 Find out how we can help you look your best now, in time for the holidays: gatherings, events, parties, friends, family, Thanksgiving, Christmas, the New Year. 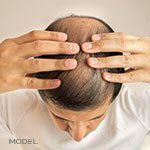 And, find out how seminar attendees can double their discounts only at the seminar. 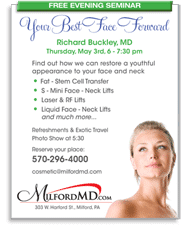 Please join us to learn about the newest techniques in facial rejuvenation. 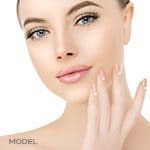 • Body Work • Breast Augmentation: Synthetic & Natural • Laser Liposculpting • Liposuction – Lipo Etching • Tummy Tuck – Abdominoplasty (small & medium) • Cellulite Treatment. 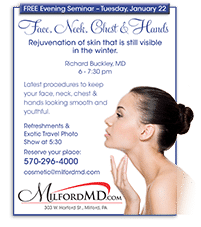 Find out how we can restore a youthful appearance to your face and neck.